The likes of Akai's APC40, Novation's Launchpad and Livid's Block all owe a debt to the monome controller, of which a revised version has just been announced. This is known as the grayscale sixty four and, naturally enough, sports a matrix of 64 buttons. The backlights are bright white, while the device itself is made of black silicone over a strong steel enclosure. 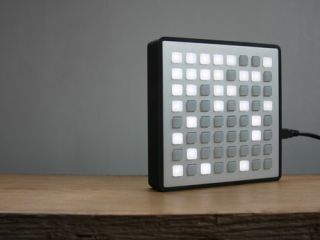 "We've been prototyping for over a year and are very happy with the weight, durability and aesthetic of this updated design," say the monome's creators. "The white LEDs are bright even at low power, which has allowed us to design a bus-powered, tilt-enabled one twenty eight. The new enclosure is inspiring many new ideas." Look out for the grayscale sixty four in January priced at $500.